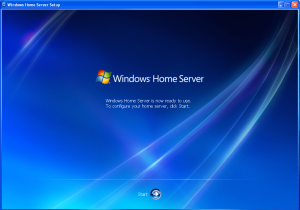 Though the name might lead you to think otherwise, Windows Home Server is also well suited for the small business and home office environment. 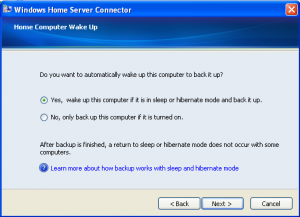 The client PC backup software is one of the most compelling features for home users and small businesses alike, and I’ve previously talked about how we use Windows Home Server at my own place of employment to back up all of our development workstations. 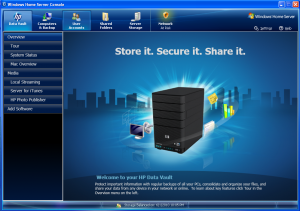 The StorageWorks group at HP has recognized this value and introduced their first Windows Home Server offering last October with the X510 Data Vault, which leveraged the proven MediaSmart Server platform while offering an extended 3 year warranty and new sales channels. 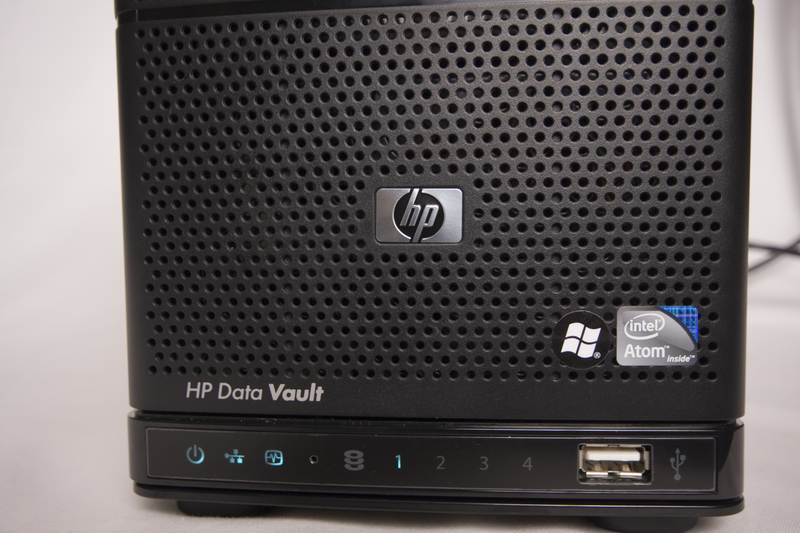 The just announced HP StorageWorks X310 Data Vault is the latest Windows Home Server offering from HP, and is designed to provide small business data protection and file sharing at a lower cost than the more feature-rich X510 Data Vault. 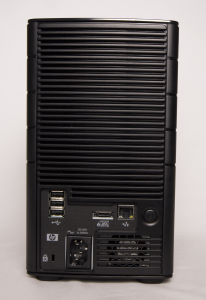 While the remote media streaming and video converting features of the high performance X510 are desirable for many home users, they often go unused in small businesses and add cost to the product. 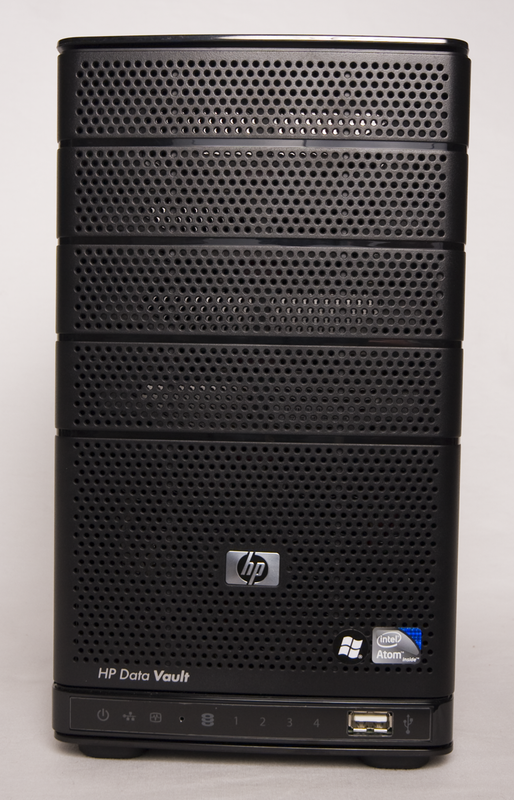 HP wanted to produce an entry level server that meets the needs of businesses that want the backup and storage capabilities without the extra media features, and they have accomplished this with the new X310 Data Vault. 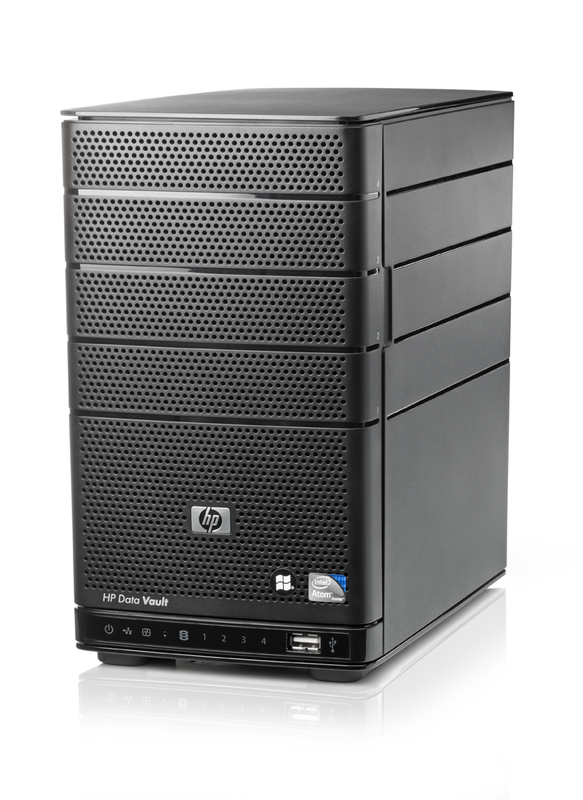 In addition to the reduced feature set of the included software, HP also made changes to the X310 hardware to further bring down the cost. The underlying chassis and form factor is the same as the X510 Data Vault, but the components and outer coverings have all been changed. The fancy light pipes, glossy black side panels, and metal mesh door of the X510 have been replaced with matte black plastic all around. The hard drive indicators now reside along the bottom front of the server next to the power, network and health LEDs, and the X310 stands on thick rubber feet instead of the tapered gray platform of the X510. All these changes combine to provide more of an industrial feel, and while this is not necessarily unpleasant it is certainly not as refined as the X510. 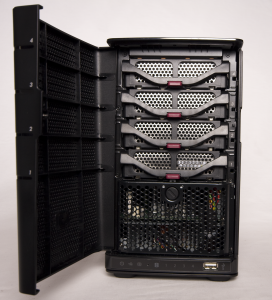 The X310 Data Vault comes in a single configuration that is powered by a dual-core Intel Atom 1.6Ghz processor, 2GB of RAM, gigabit ethernet and a single 1TB hard drive. It has 3 empty internal SATA hard drive bays, 4 USB ports, and a single eSATA port that is port-multiplier aware and so will work with multi-drive external eSATA enclosures. All this adds up to a large amount of available storage expansion that leaves plenty of room for a businesses storage needs to grow. The familiar tool-less hard drive trays are included for use with the internal drive bays which makes adding additional storage a quick and easy operation. 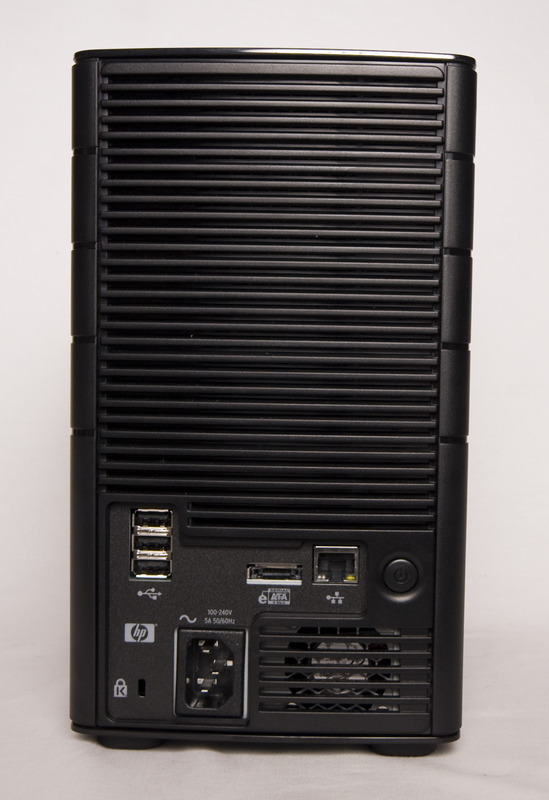 I was also pleased to see that the X310 utilizes the newer power supply model with the rear-mounted fan that has proven to be more quiet than the earlier MediaSmart Server models. The Atom processor is definitely not as powerful as the dual-core Intel E5200 processor found in the X510, however the reduced features of the X310 don’t require as much horsepower and these changes allow the price to be significantly less. Here is a look at how the X310 compares to the X510. The combination of reduced software features, lower performance hardware, and a shorter warranty all lower the list price of the X310 by $150 over the base model X510. 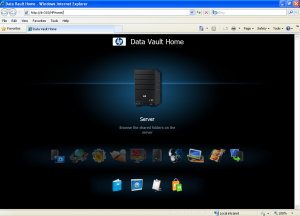 The HP StorageWorks X310 Data Vault is built on Windows Home Server, which is a platform that provides many valuable features right out of the box. I’ve already mentioned the ability to perform automatic image based backups of 10 client PCs which is likely to be one of the most appreciated features for a small business. 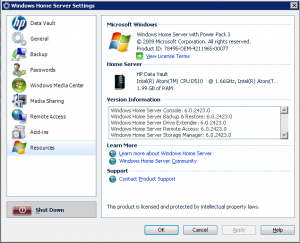 Windows Home Server also provides Remote Access features that allow you to connect to your Home Server from anywhere outside the home, so that you can access files and even control your PCs that support Remote Desktop. 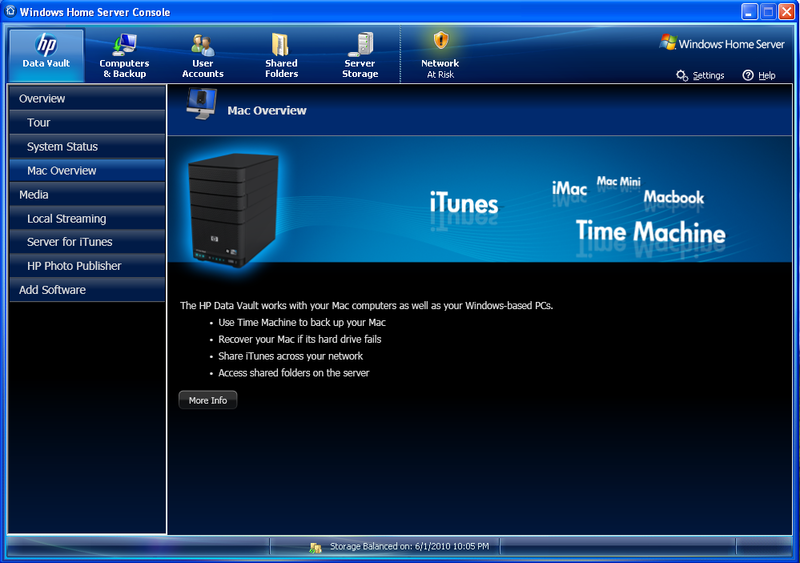 Businesses that also use Apple Macs will be pleased to hear that the Data Vault includes Mac Client software that allows the server to be used as a Time Machine backup location, so you can back up your Mac to your Home Server and then restore it easily in the event of a hard drive failure. 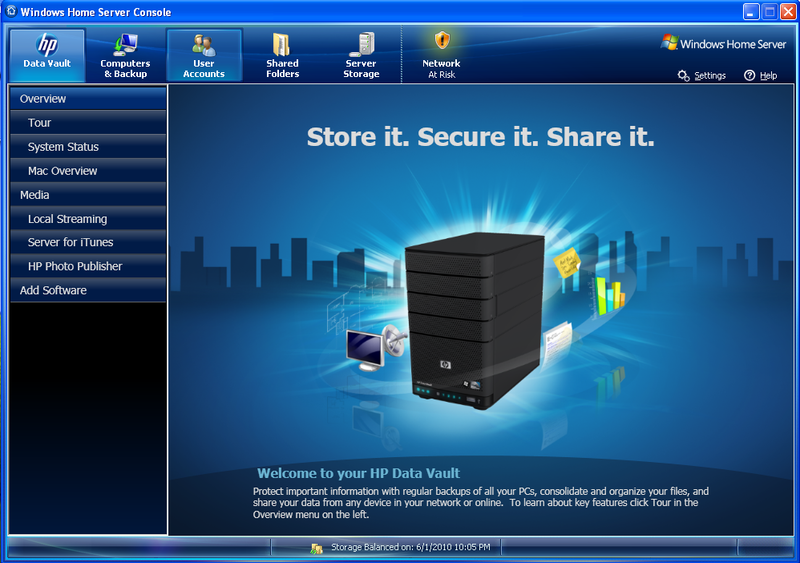 HP is including a modified version (3.1) of the Data Vault software, and one of the biggest changes is the removal of the Twonky media streaming software which means that the Remote Media Streaming features of the X510 are not available in the X310 and that the iStream app for the iPhone and iPod Touch also will not work. 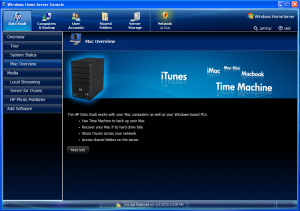 The iTunes server is included on the X310 for streaming your music to iTunes within the home or office. The Media Collector feature also does not appear to be included on the X310. 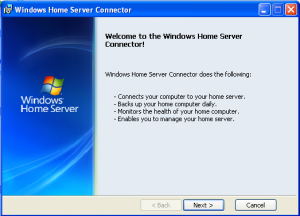 Windows Home Server comes with Windows Media Connect 2.0 for media streaming in the home, and many network media players can also access the server resources via Samba or NFS. The Video Converter is another feature that was removed from the X310, but given the relatively low horsepower of the Atom processor I don’t think this feature would be very useful. 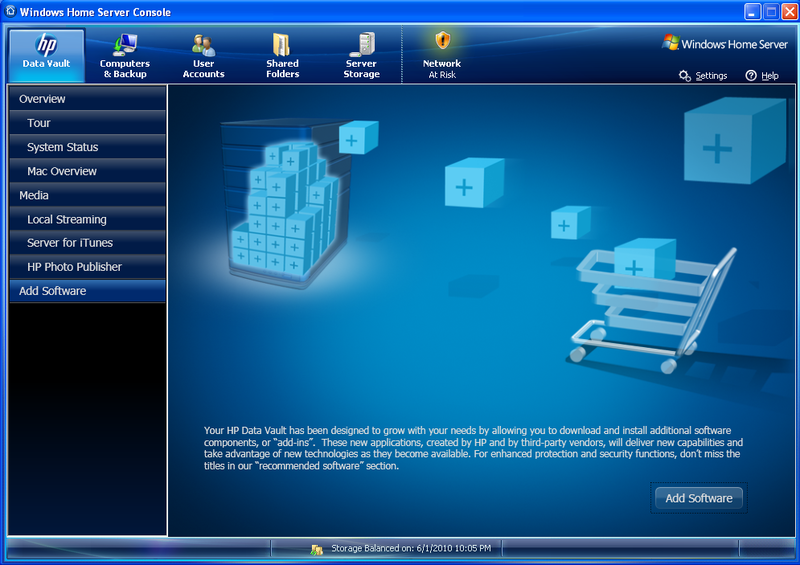 The PhotoViewer and PhotoPublisher are both included in the X310 Data Vault. The PhotoViewer is a web page on the server that allows you to share photos with directly from your Home Server, while the PhotoPublisher allows you to easily publish your photos to many popular photo sharing sites such as Facebook, Picasa, flickr, and snapfish. 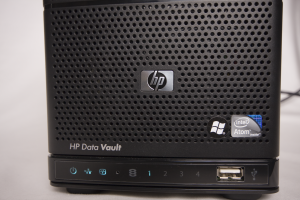 For a more detailed look at these features, you can read my review of the HP 3.0 software as delivered on the X510 Data Vault and EX495 MediaSmart Server. 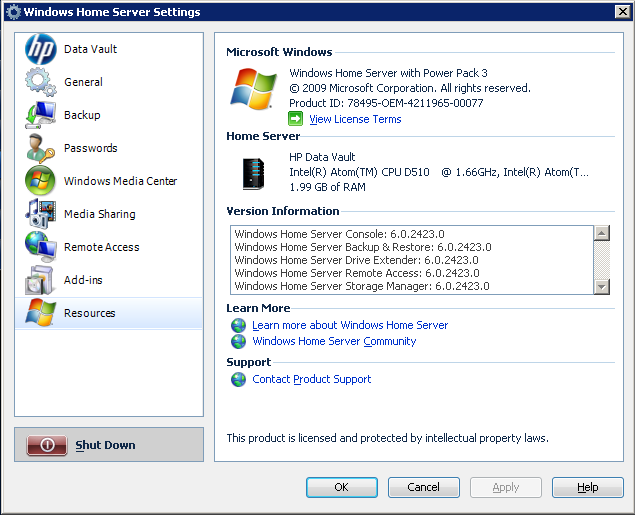 Finally, the X310 Data Vault includes the same trial version of the McAfee antivirus Add-In for Windows Home Server that has been included in all the HP Home Servers. If you are familiar with Windows Home Server, then the setup will be a straightforward process. 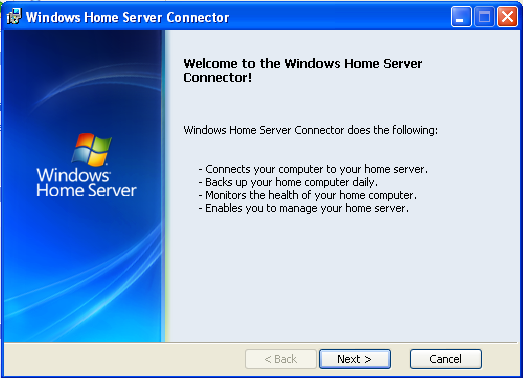 First you connect the server to its power cord, and use the included ethernet cable to connect the server to your router or a switch on your network. The Data Vault is powered on with the press of a button on the rear of the server, and when it is booted prior to setup the LEDs will “breath” with a slow fade/brighten pattern. 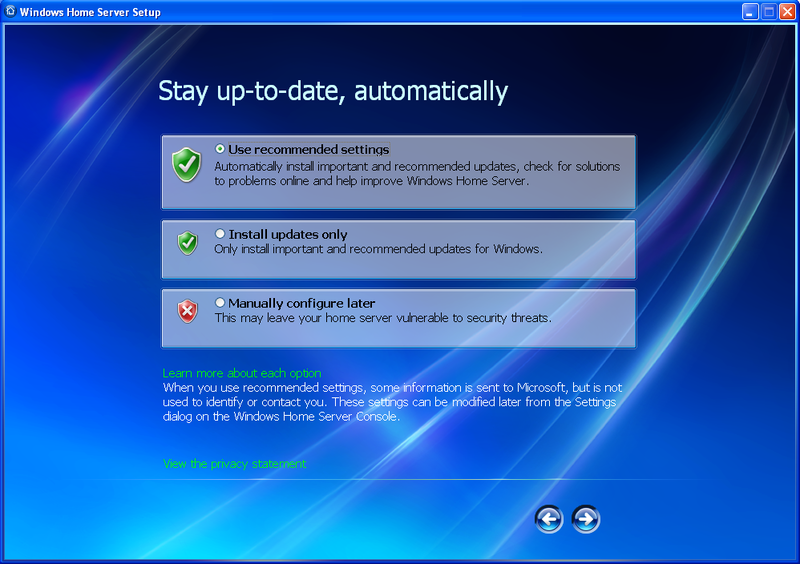 Insert the Software Installation Disk into your client PC, and a setup wizard will guide you through the installation process. 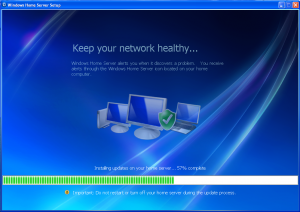 After the client software has finished installing, the next step is to walk through the Server Setup wizard, where you will choose a name for your server, setup an administrative password, and download the latest Windows updates. 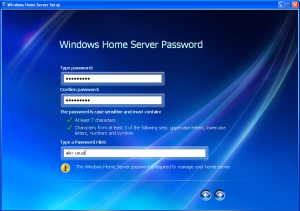 The server will reboot after downloading updates, and you can now use your Administrator password that you created during setup to log into the Server Console and continue setting up your user accounts, Remote Access, and other settings. 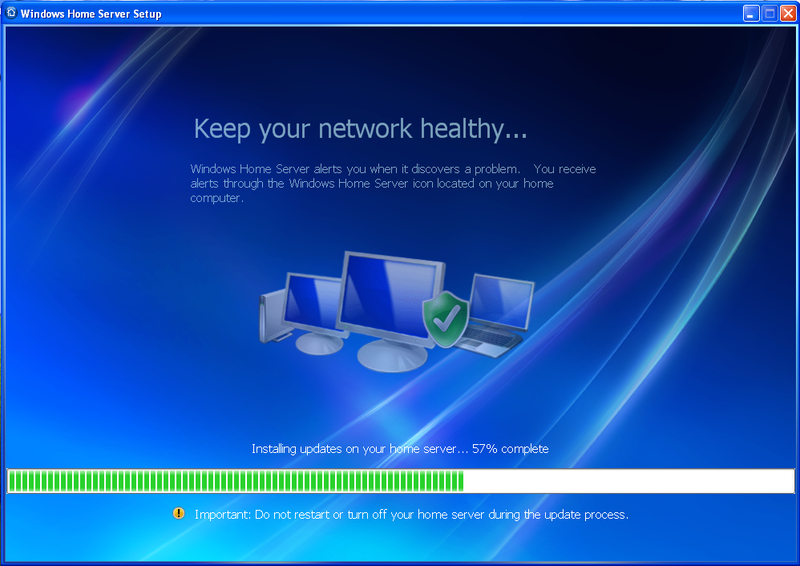 The Server Status tab is a useful overview of the status of your Home Server as well as visuals of the CPU, RAM, and Network utilization. The dual-core Atom shows up as 4 processors due to the Hyperthreading feature of that CPU. 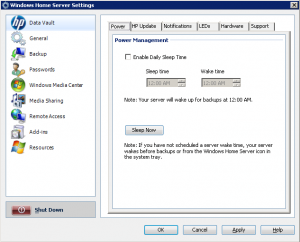 The Mac tab describes the Time Machine backup feature, while the Add Software tab provides a shortcut to the HP Data Vault page where you can learn about the latest Add-Ins available for download that extend the functionality of your Data Vault. 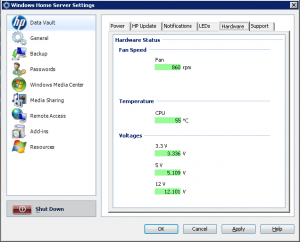 The Settings Tab of the Server Console provides access to the LED controls, Notification settings, temperatures and fan speeds, Software Update settings, as well as Support links for more information. 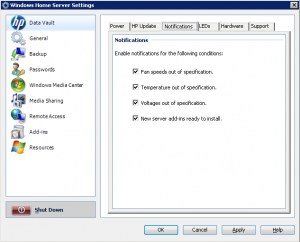 The client Control Center application resides on the client PCs and provides shortcuts to the server features, and it appears to have remained unchanged from the previous 3.0 release. 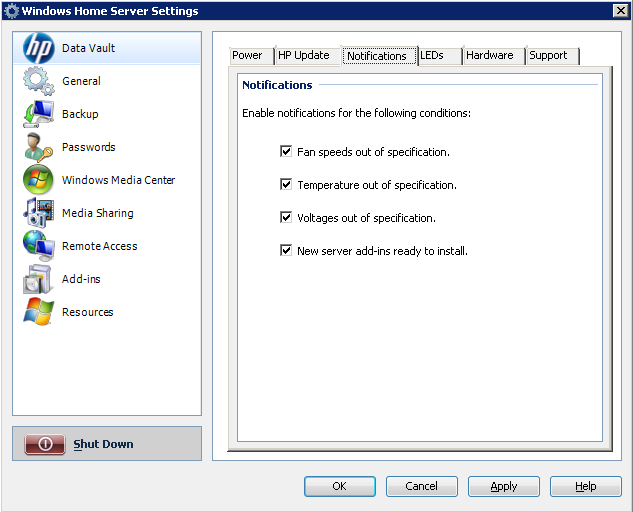 I have only had the HP StorageWorks X310 Data Vault for a few days and so have not fully tested the new server, however from my experiences so far I can say that I find the performance and features of the X310 to be acceptable for its intended duties. The performance is definitely not up to the same level as the X510 Data Vault, but the responsibilities of the server are also lower. 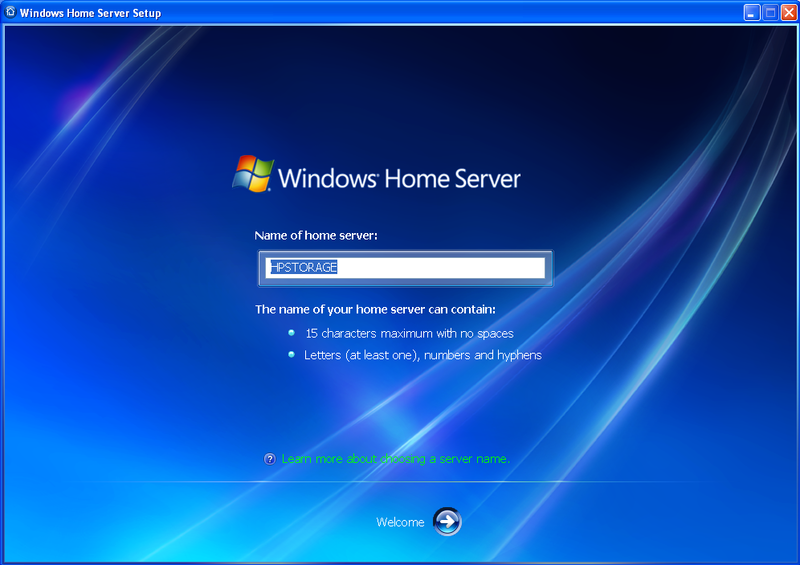 The Server Console is usable though not as responsive as the X510, and it does take longer to load. 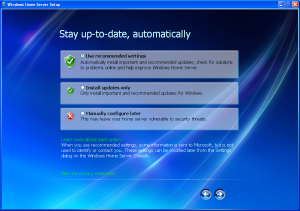 You will want to be aware of the Add-Ins that you install, as performance could be impacted if they have high system requirements. When I first saw the changes to the outer hardware of the X310 Data Vault I have to admit I was less than thrilled, however my impressions have changed now that I’ve got my hands on a unit. The chassis is very sturdy, the plastic door does not feel flimsy at all, and as someone who always turned the LEDs down to the minimum brightness I actually like the reduced light output of the new hard drive indicators. There is obviously a cost savings in the changes made to the appearance of the server, but the changes were made in a quality way and the server does not feel cheap. I believe that the reduced feature set and lower cost of the X310 Data Vault will appeal to small business owners that recognize the value of Windows Home Server but were put off by the consumer feel of the additional functionality of the MediaSmart Server or X510 Data Vault and the higher price that those features commanded. With some sale prices and incentives that we’re used to seeing from HP occasionally, the X310 should be available below $500 before too long which will likely fit into more budgets. I’ll be spending more time with the X310 Data Vault, including my customary tear down of the server, close examination of its components, and power consumption measurements. Post in the comments if there are any specific questions you have that you’d like to see answered in a later article. 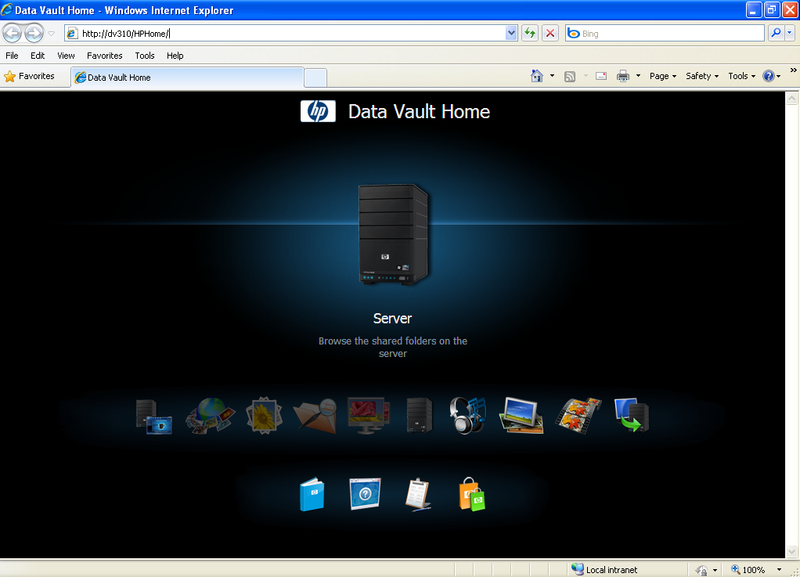 Lastly, I want to thank HP for providing me with the X310 Data Vault review unit. Any idea if warranty renewals/uplift will be available through the channel? 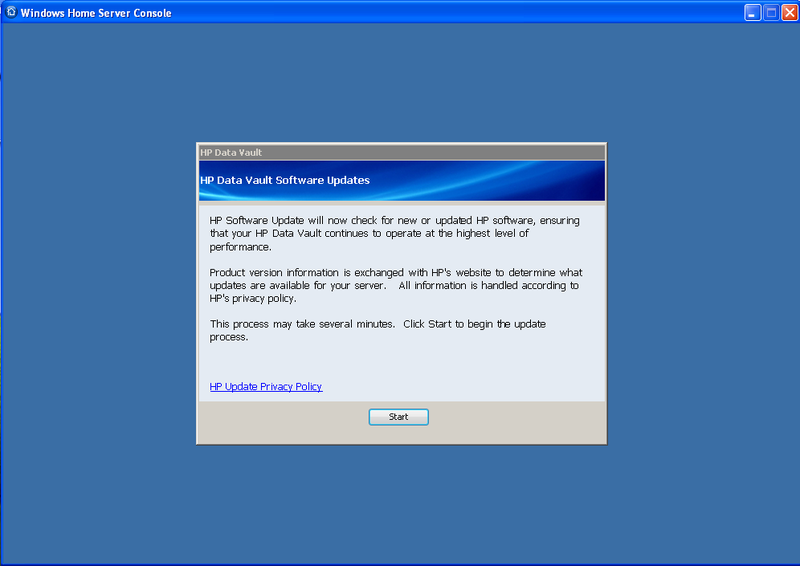 Hi John, I asked HP and they said that at this time they do not have a carepack offering to upgrade the warranties. I hope that answers your question. Akex which Duel Core Atom did HP use in the X310? I have been trying to convince my employer to get a WHS just to backup their computer. I even tried to tell them I would recycle an older unit for them but they just do not get it. So I am going to bring a server into work and let it do its business and demonstrate to them its value. The X310 seems it would be a nice fit for them. 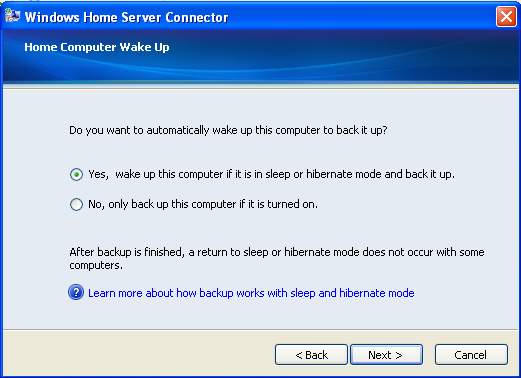 It could be setup and left to do its business just as a backup device. 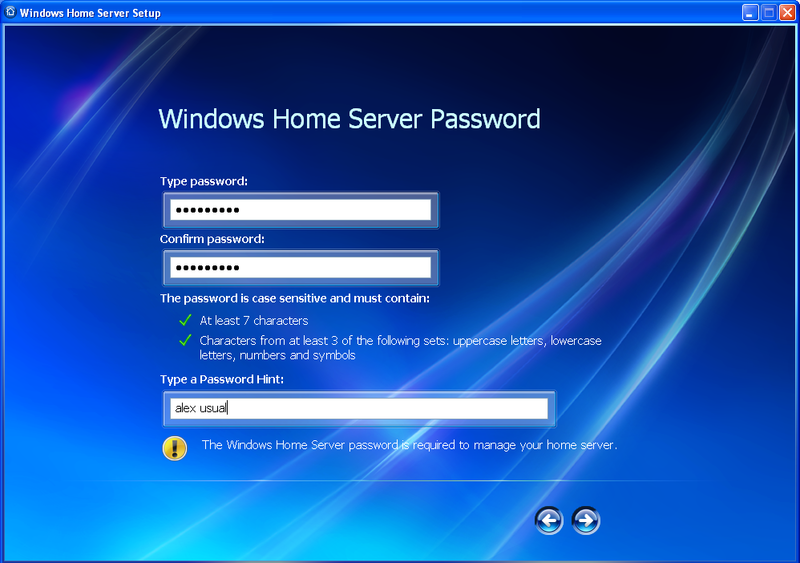 Now the do have a server but its like a secret and locked in a secure room like its a necessary evil device. @Comp1962, It’s the Intel Atom D510. Definitely let us know if you end up getting one and how you like it! @Diehard, I mention it in the article, but the hyperthreading makes it appear to be 4 cores. My Acer Aspire Revo 3610 appears the same way in Task Manager. How does the x310 compare to a ex495 or the like? Is this just a new iteration, or something different entirely? Hi Keith, the X510 is essentially an EX495 with a new name so where I compare the X310 to the X510, you can consider it as being the same as comparing the X310 to the EX495. Here’s my review on the X510 for more details on that. 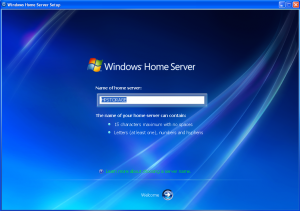 I forgot to mention on the Home Server Show Podcast #93, but you know what I want. Photos of the X310 motherboard. Thanks. Good show, I just finished listening. I’ll be posting my usual “Closer look at the hardware” article in the next few days and will have plenty of pics. Alex, I noticed one of the photos shows 4 CPU. What’s up with that ? Shouldn’t the dual core only show 2 CPU’s ? I like this downscaled version of the ex495/x510. Seems to be a smart device and a good choice for those who only wants to backup their data. I wonder why microsoft also adverts an x312 – is it a typing mistake? The x312 should be available in germany on 26 june at the wellknown “Media Markt” shops. At the time I published this article, HP had not provided me with info on the X311 or X312. I’ve since put in a request to HP for more details on these models and will be sharing the info as I receive it. One thing I’m wondering is how HP has modified the software installation to remove the extra media functions (itunes, converter, collector, etc.). Is it the same software as the the other MediaSmarts, but with some special config to pull out the extra functions, or different software altogether? It’s the same software with the media features not installed. I was more or less referring to the fact that the main console tab has most of the media stuff removed, yet though my experimentation this tab is added by the (monolithic) HomeServerConsoleTab.HPConsoleTab.dll. In the 3.0 software HP moved to an Add-in model where sub-tabs can be added and removed. I have the 3.0 software on my ex495. I have yet to figure out what [registry] setting(s)/file(s) control what sub-tabs appear on the first MediaSmart server tab. 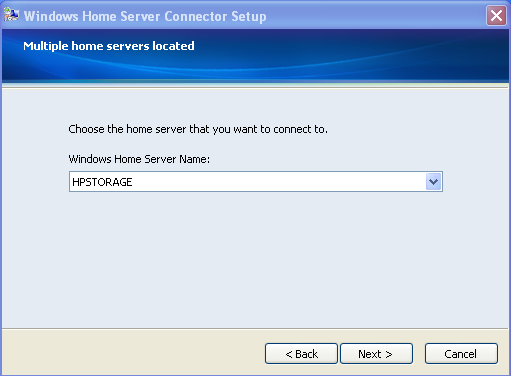 It is definitely controlled by HomeServerConsoleTab.HPConsoleTab.dll, as right now I have the DLL renamed such that the WHS console doesn’t find it. But I wouldn’t mind re-enabling it especially if I could control exactly what appears on it. I would imagine some poking around the x310′s c:\Program Files\Windows ome Server\ folder would shed some light on it. 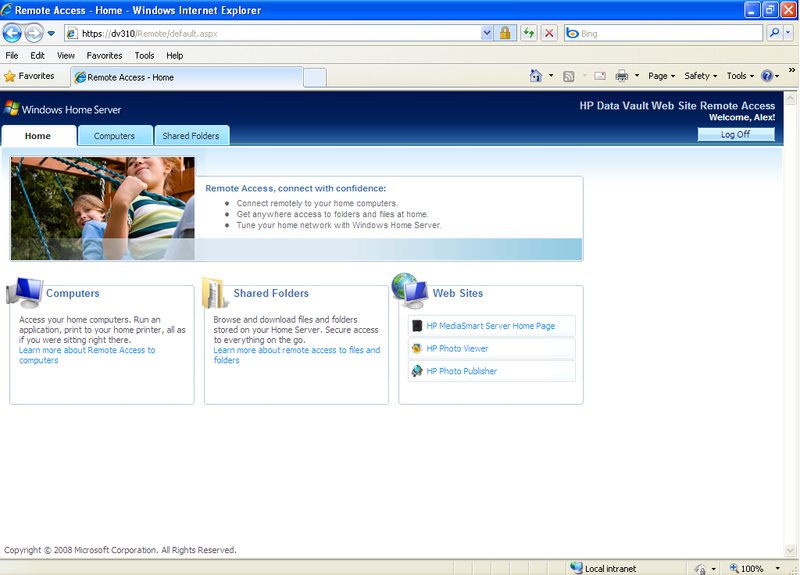 Or HKLM\Software\Hewlett-Packard\HP MediaSmart Server. RehabMan, what exactly are you trying to accomplish? I assume he wants to know if it is possible to enable the features of the x510 also on the x310. I think that is possible by tweaking some registry settings. Let us wait until some others buyed the box and played with it about some weekends, I am sure that someone will try to enable the mentioned features and publish some words how to do it exactly. All the media components are 3rd party products that were integrated into the previous MediaSmart and DataVault models. 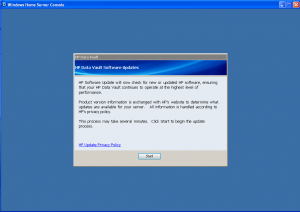 These 3rd party software packages are not just disabled, they are removed from the installer. I imagine it’s possible for someone to gather up the missing components from a donor system and make something work, but this would likely be a fair bit of work and would likely have suboptimal performance on the Atom platform. @DataKill/@Alex – Actually, it is just the opposite. I have a ex495 (same as an x510) and would like to disable all the s/w features that are not present on the x310. That is, I wish my ex495 dashboard looked like that of the x310. I don’t use those features and would rather have it behave closer to WHS stock. It is probably all a moot point at any rate, because at some point (hopefully sooner rather than later), we’ll all [hopefully] be moving to WHS “Vail” and that will be a completely new ball game. RehabMan, I thought you covered that fairly extensively in the forums. Does the X510/X310 use the EX49x style PSU? The only two things wrong with my EX485 are (a) the buzzy PSU fan and (b) the lack of port replicator support. Disregard! … I went back and FULLY re-read the article/review and saw that it does both. Hey Alex, is the CPU in the x310 a 64-bit CPU and can you install WHS ‘Vail’ on it? Rod, the Atom D510 CPU in the X310 is indeed 64-bit so there should be no issues installing Vail as I describe in my Vail guides, though I’ve not yet tried it. I have had so many network problems with my EX-195 that I have disconnected it, and purchased a X310. I called HP on numerous occasions, and have gone through the whole tedious process of uninstalling the connectors, etc, etc. So, do you know if there is there a way to transfer all the data from my 640gb drive to the new 1TB? I cannot find any information on this. Keep in mind that the EX powers up just fine, and the drive spins up fine also, but cannot get this thing on the network. Thanks…. Try this guide in the wiki, and check out the forums for more tips. Do post in the forums if you’re still stuck. Have you done any power consumption measurements yet? I have been looking into this model. My main goal is to mirror my main drive. I’m a bit confuse about the total amount of drives it can hold. For example, this drive says 1TB, does that mean that the other 3 can’t amount to more than 1TB? Any help will be much appreciated. I have one. It comes with a single 1TB drive. It has slots/room for three more drives. I’m pretty sure it will support 2TB drives in all slots (with a re-install needed if you replace the system drive). As Brad says, you can use any capacity of SATA hard drive up to 2TB. A good year and a half later, it’s insanely hard to find any information about if there has been a change to this capacity limit. Is 2TB the limit, or can you hook more up… The quest goes on, until someone tries it out, and reports back. I’m looking to pick up a second hand x310, but for now, i don’t have any 3TB (or larger) drives, so i wont be testing it anytime soon. Here’s more info on 3TB drives. Thanks Alex. Can i have 2 drive backup different things and use that share feature to duplicate the files? For example; Drive 1 and 2 will be the same and 3 and 4 will be the same but different than 1 and 2. I want to use time machine and backup other files from other PC’s. Is this possible? 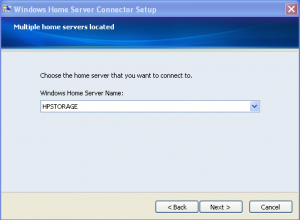 No, Drive Extender is the duplication and expansion technology used by Windows Home Server and it does not allow control of where files are stored, all drives are added to a storage pool, and duplicated files are stored on more than one physical hard drive. You could designate two hard drives for duplication and then use the built-in Server Backup feature to back the shared folders up to the other two drives, but that would be a manual operation. There has been extensive discussion on this in our forums. There is no real need to control where the data is stored, perhaps if you better elaborate on what you wish to accomplish we can advise you how to get there. The forums are the best place to have this discussion as the entire community is more likely to engage you there. Thanks for the info. I want to backup files, programs, music, picture, and movies. 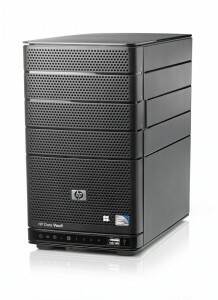 Which one will be best for the x310 home server? I tell people to use drives they are comfortable with. 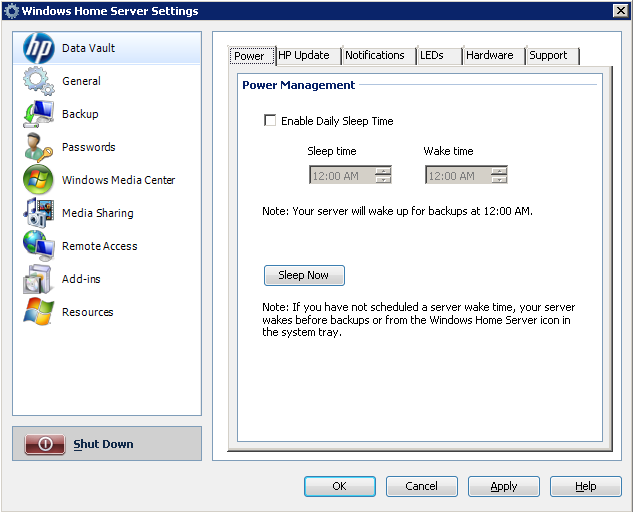 The drives I use are WD Black, and Hitachi Deskstar. If you read through the forums you will find what others use with their servers. 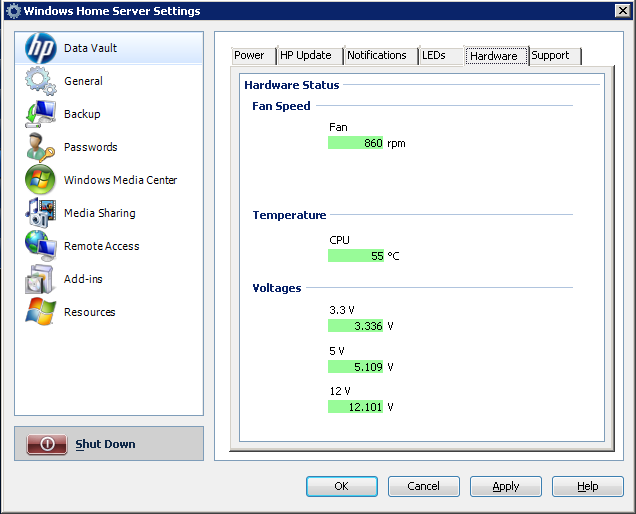 Some like Green Drives for low power consumption and low heat profiles. You may want to read up on Advanced Format Drives and how to prepair them for use in WHS as more and more drives being made are now Advanced Format. Some like the Segate LP Green Drives which are Advanced Format and do not require alignment for storage pool drive use but not certain about what you do with them to use them for a system drive. If i replace the 1TB drive that it comes with. Is it easy to re-install the WHS that it comes with? I want to replace the drive with a 2TB. Yes but I believe you have to connect a network cable directly between the server and the computer your performing the recovery with. There are many thought processes to what size drive to use as a system drive because WHS will only use the DATA Partition on the system drive when there is no other place to store data. So if you fill the remainin 3 bays up with say 2 TB drives it will take sometime before WHS will ever use the data partition on the System Drive. So using a large drive for a system drive is not always wise. If you have no objection to expanding the server outside the box then I would not bother to change the system drive unless you do not like or feel comfortable with the OEM Drive which I believe is a Seagate. On everyone of my servers the system drive is never used to store any storage pool data so for me a large system drive is viewed as wasteful. However if you have no plans on expanding the server outside the box and wish to maximise the 8 TB Capacity it can support then maybe a 2 TB system drive is not such a bad idea. This topic has been discusses accross the forums and there are many thought processes as to whats the best size system drive to use. I think most would agree that using a 7200 RPM Drive is important. Also keep in mind that most drives being manufactured are now Advanced Format so for use as a System Drive you would be required to Align them so keep this in mind but if your going to install say WHS2011 then AF drives are not an issue for use as system or storage pool drives. Please do take the time to scan through the forums because they are packed with a ton of very useful information. Hi again. I received my x310 and configured it using a Windows machine. I also have a Mac. When i try to use the x310 for the time machine, it tells me, that i need to create a Mac share folder. I did, but don’t think it was the right way to created. I need help, so i can back up my Mac computer. Also, on the Mac, when i hit connect to server, i use the name of the server, and it doesn’t find it. I’m new to this home server. Just trying to figure this out, and hitting a wall. Please help…. I recommend you post a request for help on this matter in the forums. There are others with MAC’s currently using their MediaSmart Servers to backup their MAC. Also there has been some reported issues with LION that have caused issues with Time Machine but there are posts about that issue as well in the forums. I think you will get more favorable results in the sites forums. Good Luck with your x310 and welcome to the site and hope to see you here more in future. So, i tried the forum and I have not got a response on my question. I’m having mutiple issues. 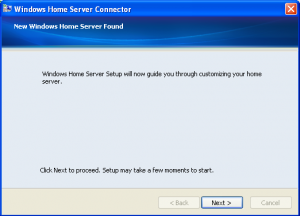 I have to restart my server to connect remotely. I’m trying to setup a static IP address so i’m won’t have so many issues. Also, i can’t seem to get it to work with time machine. Do you have a link where this is discuss. I have a feeling i have a defective server. I’m going to re-install the software, to see if that will work. Any suggestions, will be much appreciated. 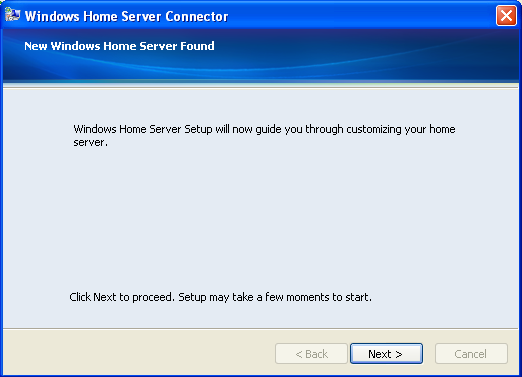 For a static IP the best way to set that up is if your router can reserve IP numbers then have the router do it. Much easier than doing it on the server end. Look forward to seeing you in the forums. Actually you did have a response in the forums but you didn’t reply with any additional info or questions. Don’t use a static IP, use DHCP Reservation instead. Thanks! I kinda figure that. I’m still waiting for my router to come in. Currently i’m using an older model wifi linksys. Btw, I figured out how to get the time machine to work. Still learning the pros and cons. I have the x310. Worked well until the the software failed and my saved image failed to work.. Has been a paperweight since. Have tried to get the image from hp, but haven’t any luck. HP’s help website is a nightmare. What do you mean by “saved image”? If your Server Recovery DVD doesn’t work, you should contact HP support for replacement media. 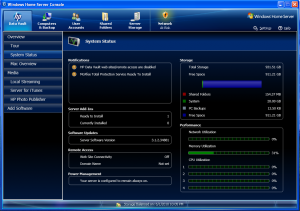 The Troubleshooting forum has a sticky topic on how to contact support directly and easily. Please post in the forums if you need additional help. Newegg has a sale on the X310 for a final price of $224.99. What I am wondering is if anyone has installed WHS 2011 on the X310. My current EX475 has the infinite flashing health light so I am looking to swap it out.